If you follow the blog, you probably know by now that I am a horse person. If not, welcome to today's revelation and post about horse racing. Although my love for horses has brought me to a lot of horse shows and horse related events, I have never been to any of the bigger horse races (excluding watching a quick race at Saratoga in New York about 6 years back). 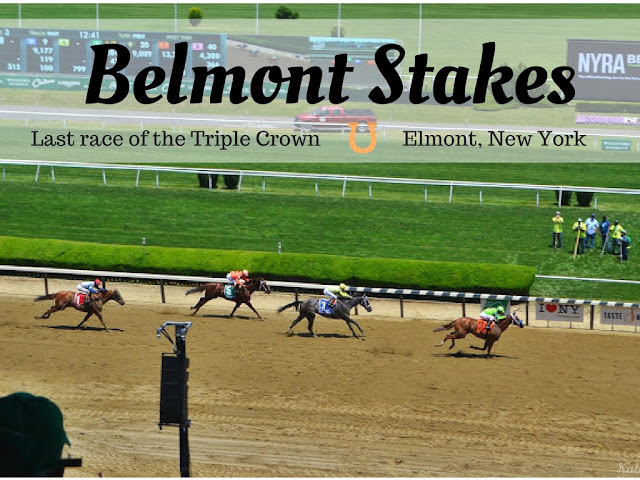 As far as horse races go here in the states, the Kentucky Derby, the Preakness and the Belmont Stakes are the biggies, all with the three races for three year old thoroughbreds that make up the Triple Crown of Thoroughbred Racing. To have a Triple Crown Winner, you need the same horse to win all three races in one season- this feat being one of the greatest accomplishments in thoroughbred horse racing. 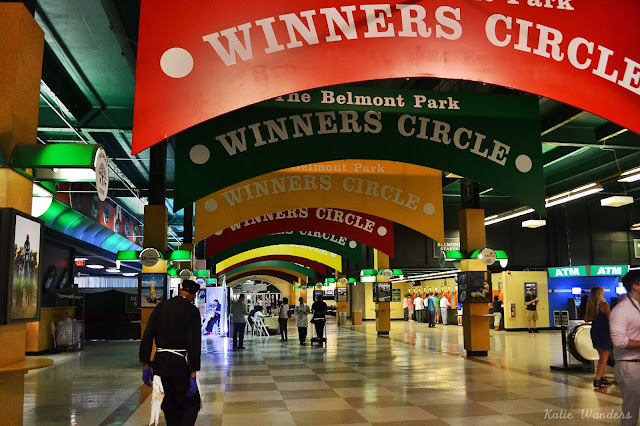 The Belmont is held 5 weeks after the Kentucky Derby, and 3 weeks after the Preakness Stakes. I knew the Kentucky Derby was obviously in Kentucky, and assumed the other famous horse races that make up the Triple Crown were somewhere far far away as well. Little did I know that the last, longest and toughest race of the Triple Crown Series, the "Test of the Champion" and "Run for the Carnations", was held right here in the northeast- on Long Island. 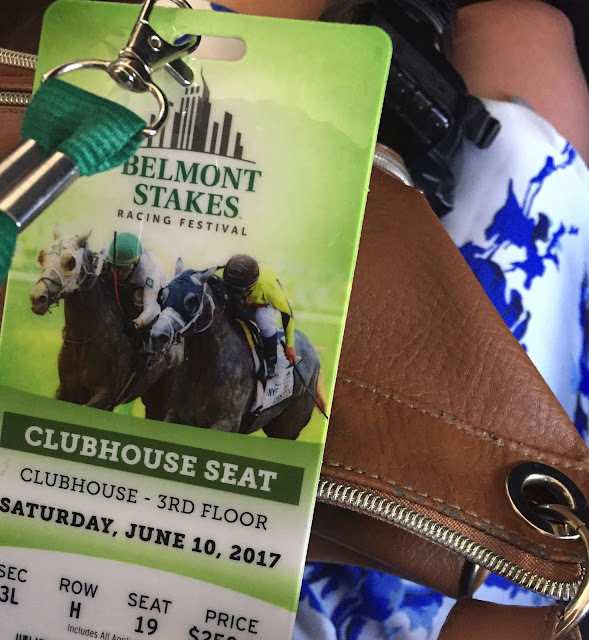 Jump in the car and in about a 2 hour drive, you can be trackside watching the Belmont Stakes. 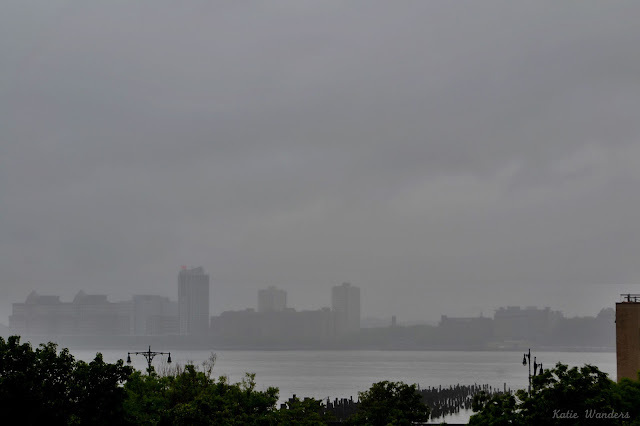 Day 2 of our Girls Trip to NYC proved to be drier than the first. While the sun never really came out for too long, it finally stopped raining. Second day I had planned for us to take the subway down to Brooklyn, find these rainbow bagels Amanda spoke about, head to the Brooklyn area/Park right by the bridge to get this picture below (my favorite view of the city!) and then walk the Brooklyn bridge back over to Manhattan (you can read my entire post about walking the Brooklyn Bridge here). 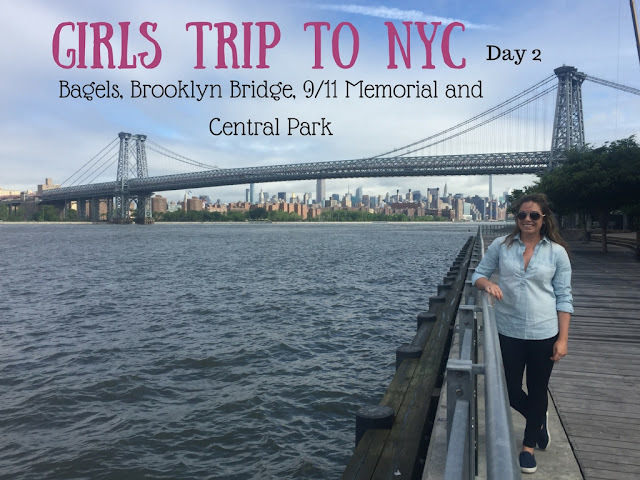 After the bridge, we would head to the 9/11 Memorial and than catch the subway or a cab up to Central Park. In Central Park we had a few sculptures to stop and see (Amanda's request) and the boathouse and the bridge (KW request). After ALL that, we would head back to Connecticut and then eventually to Point Judith, Rhode Island to catch a ferry to Block Island. Planes, trains, automobiles and ferries was the name of the game today. New York City and I have a weird love/hate relationship. I always loved that New York City had so much to do, was so easy to get to, and has an abundance of amazing food. But I always hated how crowded, often dirty, and expensive the city could be. Before Salt Lake City, Katie and cities were like oil and water...we just didn't jibe. When Amanda mentioned wanting to head into the City on her trip to the Northeast, I was a little torn. First, cities were never my thing and I wanted to show her New England, not New York City. But how do you fly to the Northeast and not spend a day (or two) in the Big Apple? Amanda coaxed me into talk of New York City with the idea of going to see a show on Broadway, something I am embarrassed to say I have never done. Phantom at the Opera has been playing in New York City since 1988 and for about $100 we could see this famous show at the famous Majestic Theatre in Manhattan. With the show settled, we decided to plan a few other highlights for NYC. 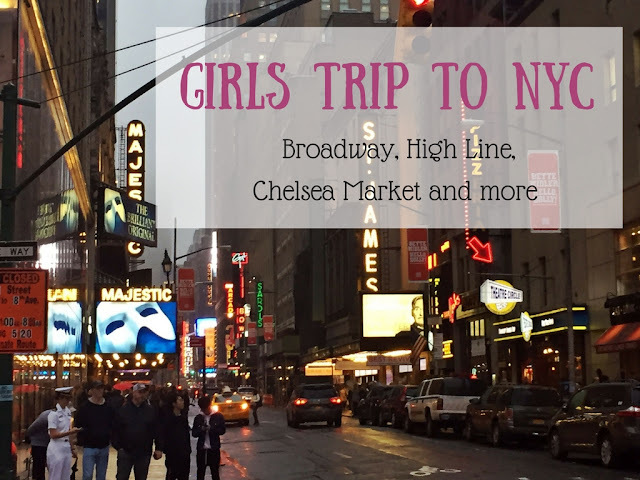 Amanda had a "wish list" which included The High Line, a walk through Central Park, going to the top of Rockefeller Center, seeing the lights of Times Square, walking the Brooklyn Bridge and seeing the Statue of Liberty. Thankfully we were able to do most of these things despite some awful unlucky weather and a shortage of time. As much as I was originally hesitant about spending two days in the city, I left pleasantly surprised and excited to return. I think my two years spent living downtown in Salt Lake City gave me a new appreciation for the hustle and bustle and offerings of our cities. I learned to embrace public transportation, chaos, and crowds. 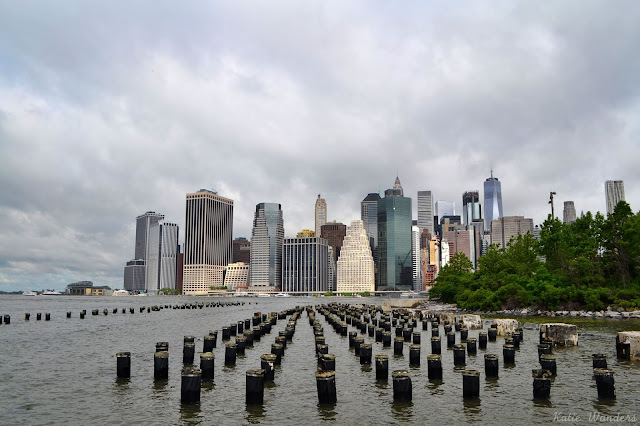 NYC was not the dirty bustling city I remembered visiting several times in the past. For starters, the rain kept the crowds at bay and Google Maps made navigating the subway system so (SO) easy. Lastly, the endless list of things to do in the city kept us more than busy despite the weather. New York, I gave you a second chance and you surprised me. To say things have been a little busy over at KW would be an understatement. Horse races, trips to Newport, some scuba diving and of course, the typical work grind has been dominating my schedule. Thanks for your patience as we (slowly) recap the last few weeks of wanderings and more specifically, showing off New England to Amanda. Amanda was flying into Boston with an arrival time of 6:30am in the beautiful city of Boston. The sun was shining, it only took me 1.5 hours to get to Logan Airport, we had just arrived at the Boston Commons, the clock read 6:50 am and there was absolutely no one in Boston. We parked the car by Boston Commons (free parking on Sundays!) and headed to the Thinking Cup for breakfast. 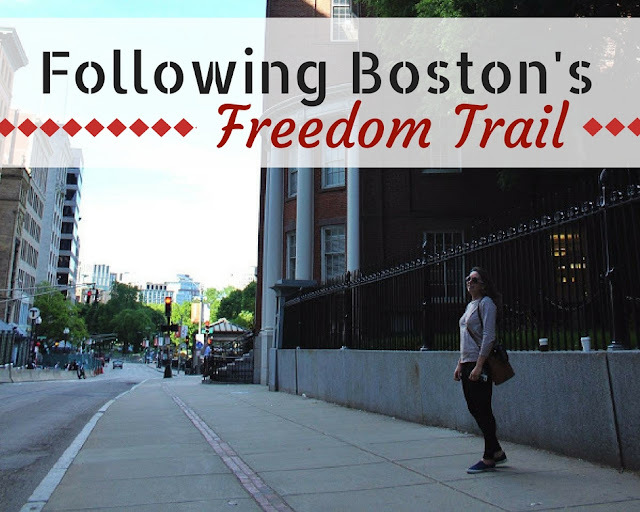 I grabbed smoked salmon on a bagel and a coffee and we headed out of the shop and on our way to the days scheduled activity: walking the Freedom Trail, Boston's most popular attraction. The Freedom Trail is something most New Englanders do at least once on a field trip as a small child. It is not something you look forward to (i.e. a whole day of walking looking at historical sites you do not give a hoot about at that time in your life). For me, the only things I could remember was the 2 billion stairs to a tower and Mother Goose's grave (it's a thing). What can I say, I was an attentive adolescent. I was really excited to spend the day in Boston, walking along the Freedom Trail and soaking up Boston's History- this time for keeps. About 20 years later, something I had dreaded on a day long field trip was now something I was waking up at the crack of dawn on a Sunday to do. Being a weekend warrior is kind of my thing. I like to cram as many crazy activities into a weekend as possible. Because I have a full-time job (and horses, and friends, and family, and a routine) it can sometimes be hard to get away for longer periods of time. But - you don't need a whole week to get away all the time. Sometimes, you just need an extra long weekend. In this case, four days will get you a lovely taste of southern California from hiking and biking to eating and drinking your way around LA County. If you are looking for a post on Rodeo Drive or how to hike to the Hollywood Sign, this is not it. This is more of an outdoorsy/less touristy long weekend in the area. I flew into LA and never really went to LA because, in all fairness, that city just didn't interest me. Instead, I spent some time in surrounding Malibu, Santa Monica, Venice, and Joshua Tree. Here is how I spent my four days (Friday to Monday) in LA County. If you are heading to the Venice/Santa Monica area of California, there is one thing you absolutely have to do. 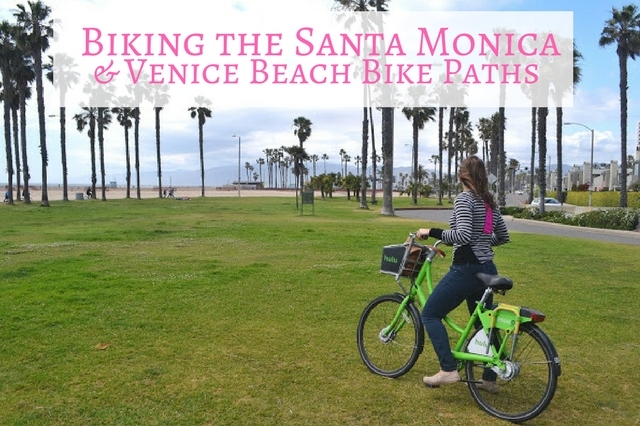 Okay, maybe two if you count eating at Cha Cha Chicken but really, you have to do this one thing: Rent bicycles and bike the Santa Monica and Venice Beach Bike Paths. A nice breeze, a beautiful bike path, some fantastic sights and people watching for slow-flat-easy-biking-miles. It is everything you expect as you cruise along the beach stopping at some of the famous sites along the way.